Looking to purchase knives? Here's what you need to know. Before you make a purchase, let Kinnek do the hard part. Submit a free request for quotes using the form to the right, and we'll get multiple suppliers to provide you their knife offerings and pricing so that you can compare all your options in one place! Knives are a virtual necessity in commercial kitchens, and it is important that you choose the correct quality, material, and style of knife to suit the specific needs of your kitchen and its menu. As knives see frequent and extended use, many businesses prefer to invest in higher quality knives from the get-go, which, over the course of years, saves money and time and may be simpler to maintain. If funds are very limited, however, it may be preferable for your business to invest in lower quality knives that can still get the job done (and upgrade later). Suppliers offer blades in a variety of materials, each with their advantages and disadvantages. Generally, the material that you select will strongly determine the price and quality of the knife overall. Stainless steel knives are difficult to sharpen, are somewhat brittle, and require more frequent sharpening, which means that they demand greater efforts to maintain. 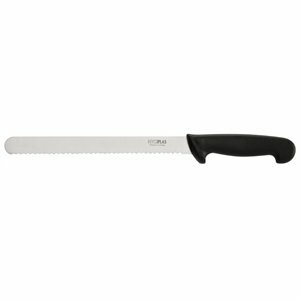 As a general rule, however, they are cheaper to purchase than carbon steel knives and are more resistant to staining. They also tend to be highly resistant to corrosion and rust. Carbon steel is perhaps the most popular material used for commercial knives. They are stronger than equivalent stainless steel knives, are easier to sharpen, and retain a sharper edge for longer, which means that they demand less effort to maintain at peak efficiency. They tend to be more expensive than stainless steel knives, however, and tend to be susceptible to staining, corrosion, and rust. High carbon stainless steel combines the best attributes of stainless steel and carbon steel, but at a high price. Though expensive, the use of this material ensures a strong blade that is easy to sharpen and retains a sharp edge for longer, leading to less maintenance. It is also highly resistant to staining, corrosion, and rust. Ceramic knives have yet to gain mainstream acceptance, but are rising in popularity due to the ease with which they can be maintained. The ceramic used in the blade’s construction ensures a very sharp edge, and the blade itself is quite hard, allowing it to go much longer without sharpening than competing materials, and when sharpening is required, one can use silicon carbide or diamond sandpaper to do so. The risk in using ceramic knives, however, is that they are brittle and can chip off if the user is not careful, which may present too great a health/safety/legal risk for a commercial kitchen. Chef’s knives are the default - they are versatile and common, and, due to chef familiarity with this style, are often used for a variety of functions, including cutting, slicing, chopping, and mincing. Steak knives are mostly utilized as table knives for customers, and are designed to efficiently cut large chunks of meat. They come in a variety of styles — serrated edge, smooth edge, rounded tip, pointed tip, etc. Serrated edges are useful if your menu features tougher, thicker meat, as the edge will make it easier for your customers to tear the fibers of the meat apart, while pointed tips are useful for more precisely cutting the meat. 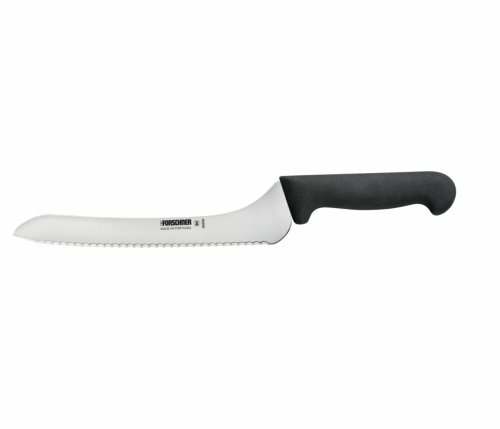 Butcher knives can be used to cut through larger chunks of meat or to thinly slice smaller pieces of meat. Cleavers are perhaps the most recognizable style besides the humble butter knife, and they are actually quite versatile. The wide blade of the cleaver allows its user to easily chop apart bone and meat, and even thick bundles of vegetables or stems. The weight of the cleaver may also be useful for cracking open shells or smashing cloves of garlic and other spices. Paring knives come in a number of varieties, each with their own specific function. Chef’s parers, like standard chef knives, are prized for their great versatility, and can be used for peeling, slicing, stem removal, and numerous other blade-precise tasks. Stylets have a blunt tip with a grooved blade that makes it useful for cleanly slicing foods that have a tendency to stick, such as garlic. Bird’s beak parers utilize an arched blade that makes it highly efficient at peeling and garnishing. Wavy edge parers are best for slicing small pieces of thick fruits and vegetables. There are numerous other kinds of parers, and some suppliers offer different versions of the above styles, so be sure about the niche that you need to fill before purchasing. Shelling (or oyster/clam) knives come in different styles designed to pry open the shell of a specific kind of shellfish, but in general, they share short, blunt blades with rounded tips that help provide the leverage necessary to pry open the shells. Slicing knives are meant for carving - the blade is long, thin, with a rounded tip, and often with a granton edge to ensure smooth, thin, precise slicing of the meat. They are common in delis and sandwich shops. 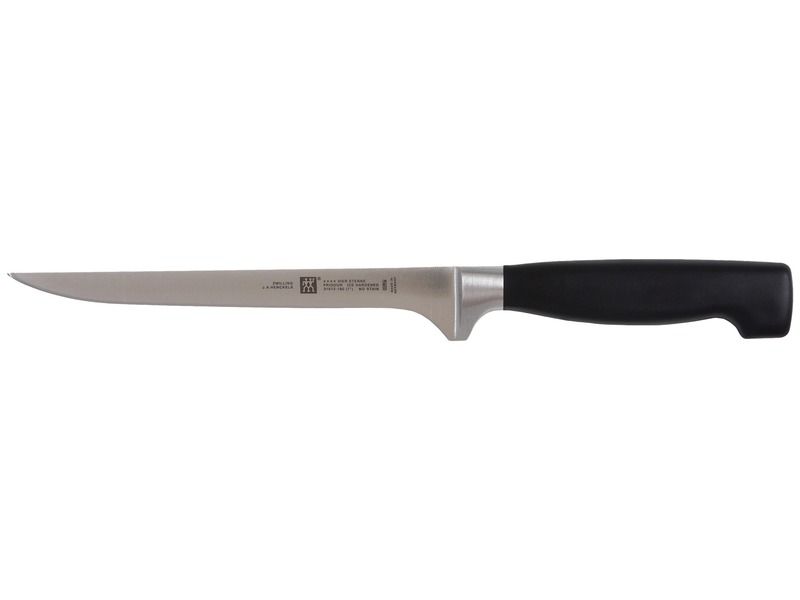 Fillet knife blades are long, thin, and flexile. The blade is designed to slip underneath skin, bone, or scales. Subsequently, the parts are cleanly and smoothly sliced away from the meat. Utility knives usually have a scalloped edge that makes it useful for cutting through softer pieces of produce or even meat, and are commonly seen in sandwich shops (where they are used for cutting tomatoes, lettuce, cold meats, and more). Petty knives usually have a pointed end and a straight edge, and though fairly versatile, the thin construction of the blade makes it best for softer produce and meats. In many respects, the petty knife occupies a similar niche to the utility knife. Bread knives feature curved blades and serrated edges to allow for easy removal of the bread crust and for easy cutting of the bread loaf without crushing it. Boning knives are specifically designed for de-boning. They have sharp, pointed tips and thin blades that enables precision entry and subsequent filleting action for removing meat from the bone. There are numerous other varieties of knives, some Eastern-influenced, some Western, but, ultimately, it should be clear that for whatever function you need a knife for, there will be a supplier that offers a form which fits that function. If you have the funds, don’t compromise! Purchase a set of knives that is specific to your needs, and you may see improvements in kitchen efficiency. Generally, when selecting a knife handle you will want to consider three factors, aside from cost: grip, cleanliness, and durability. There are numerous materials available, but the materials that you are most likely to find in your initial search are as follows. Plastic handles are the most popular in today’s commercial kitchens, and for good reason - plastic handles are usually easier to clean than competing handles, and are fairly durable. There are also a multitude of styles available, each with different levels of grip, sturdiness, and comfortability. Wood handles are still commonly in use, but many new buyers are wary of wood handles as they may present health risks. While known for comfort, Wood handled knives may increase the risk of bacterial contamination, which, though small, is often enough of a worry to encourage the new buyer to seek an alternative. Stainless steel handles are also very popular, though they tend to be somewhat more expensive than competing handles. They are top-of-the-line when it comes to durability, and, depending on the grade of stainless steel, will be resistant to bacteria. Some users also find that stainless steel handled knives are better balanced, which makes for easier, more efficient use, but others find that the grip isn't as strong, which may present some discomfort during use.